Rilastil Multirepair S-Ferulic Bi-Gel Serum is a preparation with intensive antiwrinkle action. 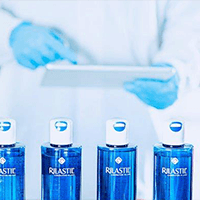 Rilastil Multirepair is the line formulated with a high concentration of biotech active ingredients, indicated for dull, tired skin, bearing signs of the time ans subject to oxidative stress, namely damaged by the action of free radicals. Rilastil Multirepair S-Ferulic Bi-Gel Serum is a preparation with intensive antiwrinkle action, suitable for all skin types. The exclusive Concentrated Antiox Complex (Ferulic Acid, Superoxide Dismutase and Microcollagen) contrasts skin aging caused by oxidative stress, free radicals and time. The innovative bi-gel texture, rich and nourishing like an emulsion, yet light and smooth-flowing like a watery gel, allows the product to perform highly in efficacy and agreeableness. INGREDIENTS: Aqua (Water) • Isodecyl Neopentanoate • Glycerin • Butylene Glycol • Mandelic Acid • Dipropylene Glycol • Caprylic/Capric Triglyceride • Isostearyl Alcohol • Butylene Glycol Cocoate • Cetyl Ricinoleate • Cyclopentasiloxane • Triethanolamine • Dimethicone • Ferulic Acid • Prunus amygdalus dulcis (Sweet Almond) Seed Extract • Propylene Glycol • Sodium Hydroxide • Tocopheryl Acetate • Ginkgo biloba Leaf Extract • Vitis Vinifera (Grape) Fruit Extract • Xanthan Gum • Acrylates/C10-30 Alkyl Acrylate Crosspolymer • Ethylcellulose • Disodium EDTA • Sodium Hyaluronate • Carbomer • Phenoxyethanol • Sodium Lactate • Dipeptide Diaminobutyroyl Benzylamide Diacetate • Superoxide Dismutase • Tromethamine • Palmitoyl Pentapeptide-4 • Polysorbate 20 • Ethylhexylglycerin • Pentylene Glycol • Potassium Sorbate • Sodium Benzoate • Hexyl Cinnamal • Benzyl Salicylate • Linalool • Citronellol • Limonene • Alpha-Isomethyl Ionone • Coumarin • Parfum (Fragrance).